Artificially intelligent bots are notoriously bad at communicating with, well, anything. Conversations with the code, whether it's between themselves or with people, often go awry, and veer off topic. Grammar goes out the window, and sentences become nonsensical. Remember the time this happened between a pair of Facebook-built chatbots, when they freaked people out so much that folks began to think the software had, supposedly, invented its own language? Well, a group of researchers at Stanford University in the US have figured out how to, in theory, prevent that chaos and confusion from happening. In an experiment, they trained neural networks to negotiate when buying stuff in hypothetical situations, mimicking the process of scoring and selling stuff on sites like Craigslist or Gumtree. Here's the plan: sellers post adverts trying to get rid off their old possessions. Buyers enquire about the condition of the items, and if a deal is reached, both parties arrange a time and place to exchange the item for cash. 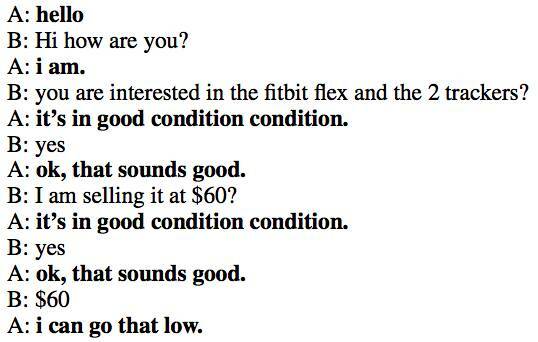 Example of a bot (A) interacting with a human (B) to buy a Fitbit. Image credit: He et al. The dialogue is a bit stiff, and the grammar is wrong in places, but it does the job even though no deal is reached. The team documented their work in this paper, here [PDF], which came to our attention this week. The trick is to keep the machines on topic and stop them from generating gibberish. The researchers used supervised learning and reinforcement learning together with hardcoded rules to force the bots to stay on task. The system is broadly split into three parts: a parser, a manager and a generator. The parser inspects keywords that signify a specific action that is being taken. Next, the manager stage chooses how the bot should respond. These actions, dubbed “course dialogue acts”, guide the bot through the negotiation task so it knows when to inquire, barter a price, agree or disagree. Finally, the generator produces the response to keep the dialogue flowing. Diagram of how the system works. The interaction is split into a series of course dialogue acts, the manager chooses what action the bot should take, and a generator spits out words for the dialogue. Image credit: He et al. In the reinforcement learning method, the bots are encouraged to reach a deal and penalized with a negative reward when it fails to reach an agreement. The researchers train the bot by collecting 6,682 dialogues between humans working on the Amazon Mechanical Turk platform. They call it the Craigslist Negotiation Dataset since they modeled the scenarios by scraping postings for the items in the six most popular categories on Craigslist. These include items filed under housing, furniture, cars, bikes, phones and electronics. The conversations are represented as a sequence of actions or course dialogue acts. A long short-term memory network (LSTM) encodes the course dialogue act and another LSTM decodes it. The manager part chooses the appropriate response. For example, it can propose a price, argue to go lower or higher, and accepts or rejects a deal. The generator conveys all these actions in plain English. During the testing phase, the bots were pitted against real humans. Participants were then asked to how humans the interaction seemed. The researchers found that their systems were more successful at bargaining for a deal and were more human-like than other bots. It doesn’t always work out, however. Here’s an example of a conversation where the bot doesn’t make much sense. 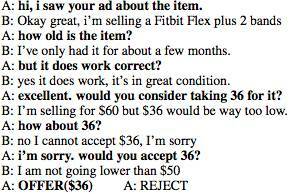 A bot (A) trying to buy a Fitbit off a human seller (B). This time, however, it fails to communicate effectively. Image credit: He et al.